Update: When I first made the Marshmallow Krispie Topped Brownie back in 2008, I had no idea how popular they’d become with my friends. For a bake sale, event or party, these are a sure thing. Okay, I wasn’t going to do it, but here it is – another recipe for today. I should have saved it for tomorrow, but I couldn’t wait to post it because these are so good! Well, at least the edges I trimmed while taking a picture. I haven’t eaten a full one yet. Thanks to the brownie mix, these came together quickly. I think packaged mix works really well here because it’s not too rich and doesn’t upstage the peanut buttery-chocolate crispy topping. This cookie/brownie has everything going for it — the texture, flavor, easiness. Apparently, it’s an old recipe, but I just heard about it recently. I’ve seen a few variations and after making variations on the variations, came up with this. I used an 18.3 oz box of Betty Crocker brownie mix, but I think any brand/size would do. I made these for a housewarming party and they turned out great. I’ve made a different version in the past but your recipe was easier for me to find and I have no regrets about going with this version. I was worried that the Rice Krispie part was too fluid but it thickened up nicely. These are so simply to make and so very delicious. I made them for a bakesale and they were gone within minutes. If you are a real chocoholic, make this recipe by substituting Cocoa Crispies!!!! Also, can use 7 oz. jar of marshmallow cream, taking lid off and heating in microwave for 1 min. or so and spreading over top of COOLED brownies then put choc. peanut butter, Cocoa Crispie mixture on top!~!! VERY GOOD!!!!! These looked sooo good, I had to go get krispie cereal and mini-marshmallows to bake them up yesterday! They are delicious and a nice gourmet looking brownie! And sooo easy to make! These came out great, my brownie layer was a little thinner than I would have liked (my box of mix was 17.5 ounces or something and designed for an 8×8 pan) but the combination of the textures was great. I topped them with a sprinkle of the mini PB cups from Trader Joes 🙂 Thanks for the guidance on storing them! I never had better brownies. I liked how the brownie condensed and the krispie topping plus the brownie made a regular thickness brownie. The crunch is such a bonus! Becky, thanks for the review! This is one of my all-time favorite recipes (at least right now), so I’m always happy to hear from people who like it as much as I do. My favorite thing about this one is all the different textures. I just made these and they are outrageously good! My boys voted them the best cookie they’ve ever eaten, which is saying something since I cook/bake a lot and we are big foodies! One of my favorite recipes is a variation of these!Rather than using marshmallows, you use chopped Reese’s pb cups and also peanuts if you want a little more crunch. We call them “Better Than Crack Brownies.” Soooo delicious! Marita, I hope you like them! THANK YOU!!!!!!!!!!! My mother’s best friend (she was like a Mom to me after my mother passed when I was 11) used to make these everytime we went to her house because I loved them so much. My mother is gone and her friend now has Alzheimer’s. I have wanted to make these for so long. I can’t wait to try these!!! They look absolutely delicious! However did I miss these the first time around??? I love all your “Favorites Lists” . Thanks for all your efforts. I have made so many fun recipes from this blog. You’re making me popular!!! My kids love this thanks…………. all i can say is……..AMAZING!!!!!!! I do think it would work. Let me know how it goes! Maybe you could do a half batch for experimentation. Hey Anna, I was wondering if it would be possible to omit the peanut butter and just use milk chocolate to melt with the rice krispies…do you think it will stay together nicely? Kelsey, I’m glad you had a chance to try them. I think this is one of my favorite bar cookies in the world. If I didn’t feel the need to try something new all the time, I would make these over and over again. These were absolutely delicious! My friends loved them! I even made them in a miniature cupcake way! The kids loved them! Thanks! I didn’t want to use a brownie mix, so I subbed the Baker’s One Bowl Brownie recipe. Not much more difficult, and the resulting brownies worked well with the marshmallow and Rice Krispie topping. I tried these at a church youth rally and now that I have the recipe I will be making them for my quilt guild meeting this week! Forget halving the recipe, I know I will have to double (or even triple!) the recipe because the family will not let me out of the house without leaving some for them too! They are so good, two favorites, chocolate and peanut butter! I made these last week and they were very nummy. I think that I used a bit too much marshmallow but they were still good. The kids loved them!! Oh. My. Goodness. How good does that look? I am bookmarking this recipe (too) as I like to bake goodies and deliver them to friends, work cohorts and neighbors. This looks like it would be popular with both adults and kids. I just made these for church tomorrow and we all loved them here!! I hope that you’re having a nice weekend so far. With the smore brownie I found it extremely hard to cut and it didn’t look very pretty. The marshmellow was just too gooey. This krispy topped brownie cut well and tasted sooo good. So far I have made these brownies, the macadamia nut with Bailey’s Irish creme, Wellesy chocolate chips, pistashio white chocolate jumbles and your toffee. All fabulous. Thanks for the recipes but also your insights on meaurements and equiptment and that kinda stuff. What happened with your S’Mores brownies? Was it the scratch part you had issues with or spreading the marshmallows? Maybe you commented and I just need to go back and check. Glad you liked this one! You know, you could probably do the S’mores brownies with mix. 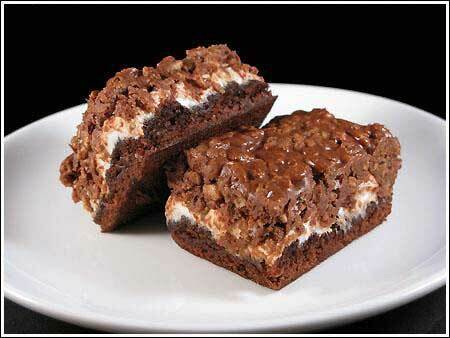 Just follow the Smores crush recipe, but bake the mix as directed above (or on the box) and pour it over the crust. These were just yummylicious! I had a box of Pillsbury brownies and they worked just fine. I was nervous because I didn’t have much success with the smore brownie you posted over New Years but this was great. The rice krispy concoction “spread” nicely over the marshmellows and I did wait a couple of hours to cut them into bars. Altogether a keeper of a recipe!! Thanks! Oh wow those look amazing and totally over indulgant! Never seen anything like these before, I intend to try soon. Wanda, thanks for the photo compliment. I’m dying to make something else today just so I can photograph it and post it. Jessica, I think the marshmallow layer helps keep these from tasting excessively rich. The top is kind of like a peanut butter flavored crunch bar or something. What a great variation on the brownie! I never thought of topping a brownie with a Rice Krispie Treat (peanut butter, no less). But hey, excess is excellent. Oh boy. These are great. They are really very easy to make and so yummy. Completely blew the diet. Excellent photo Anna. I finally had a whole one and Wow! These are SO good. The half batch version worked out beautifully and I had just enough to share. But I’ll definitely be making a full batch of these for a bake sale or something. WOW, these look incredible. And easy! I can’t wait to try these. I had forgotten about these goodies. A woman at our church used to bring these to our fellowships. If you wanted one, you would have to grab it early. Oh, I forgot to tell you welcome back from Disney World. Welcome back! Ok, now to the bars. These look perfect. That picture could be in a magazine. Excellent. I love the peanut butter and marshmallow combination. FlufferNutters were a favorite of mine as a kid. I can’t wait to make these. I don’t know what I’m enjoying more now — baking or taking the pictures. I’m having so much fun with my new camera and light box. Cakespy, I gave a bunch to my friend Rachel (Average Jane Crafter) but the rest are still here, waiting to be eaten. I meant to save these for tomorrow, but couldn’t help myself and had a few tastes. I love Rice Krispie Treats, but these are way more interesting. Therese, I can’t believe it’s taken me this long to try this recipe. It’s an old one recipe but I never see it anywhere. I think I’ll make it for the next school function….or bake sale. These slice really well and aren’t the least bit gooey if you chill them long enough. Oh, and the protein! Yes! That and the fact that Rice Krispies are fortified qualifies these as a highly nutritious snack ;). Those look wonderful. Your new camera takes beautiful pictures! I have this recipe!! These are sooooooooo good! I like to keep them in the fridge…I like when the chocolate sets and they way they taste. Whenever I make these the recipe is always requested. I wish my thighs didn’t like them as much as I do. Good protein with the peanut butter though…right??!!! tee hee!! I have made them with various brownie mixes…the chocolate chunk is good with this too!! It is good to see you in the cooking groove…that is the Anna we love!!! These look great, a nice and little bit more interesting take on the rice krispie treat. I bet they’re already gone! Well, you can be the first to review since I gave most of them to your husband :).